Finnish thrash now belongs to Lost Society, who in spite of their relatively young age, have managed to earn a following. Whether it’s because of the label they’re on (Nuclear Blast) or their sloppy/dirty image, it’s a reminder of how well Finland has done other styles of metal than thrash. Ruinside, a semi-veteran outfit with two full-lengths (including this one) to their credit, may not factor into the same equation as Lost Society. Even if the cover art for 10 Forms of Dominion is suitably cartoonish (like most thrash covers), the band’s polished brand of thrash might be too smooth to make a dent. At the heart of Ruinside’s side is vocalist Toni Salminen, who employs a brisk clean vocal delivery that goes a lot further than your typical thrash-and-shriek style. He has some moments of note, including “The Sickness” (nice hooks) and “Dethroned to be Thriven” (might be the first time the word “thriven” has been used in a song title) where he’s got a nice layered element to his vocals. In fact, he’s almost Load-era Hetfield in his delivery, something that would prompt more than a few to blush at, but at least he’s not singing tunes like “Ronnie,” eh? While Salminen has his act together, the direction of Ruinside sonically is hardly remarkable, playing a brand of everyman thrash that peels off every trick in the book. From predictable pounders like “Corridors of Power” and “Checkmate,” to oft-groovers “Dancing to the Demon’s Tune” (which sounds a smidge like Flotsam & Jetsam, actually) and “In the Arms of Bitterness,” Ruinside lacks the sort of ingenuity or separation to be anything more than a mid, or sub-tier thrash band. But hey, in Finland this may amount to something given the dearth of like-minded bands. 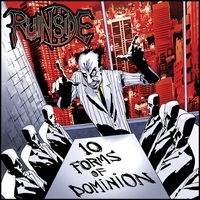 Anywhere else, it’s possible Ruinside would be an afterthought with 10 Forms of Dominion.